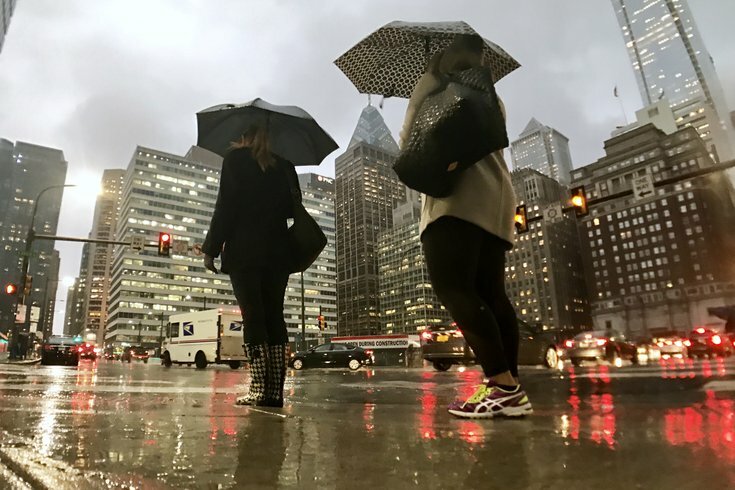 People walk near 15th and Arch streets in Center City Philadelphia on Monday evening, battling the rain and ferocious winds. The winds are expected to subside, but the rain looks to be around into Tuesday. SEPTA is warning its Regional Rail riders that their ride home looks to be difficult this evening. Passengers should anticipate possible delays of up to 30 minutes and service disruptions due to the nor'easter blustering through the region. The storm, with winds blowing at a sustained 35-40 mph and gusting from 50-60 mph, knocked down trees and electrical wires and knocked out power for thousands of customers through Monday. The National Weather Service has canceled a high wind warning, instead issuing a wind advisory in effect until 8 p.m. Winds are expected to diminish gradually Monday night, forecasters said. Outbound service on SEPTA's Paoli/Thorndale line, shut down earlier Monday, has resumed but trains are operating hourly. Train #574 will be the first inbound train to Center City, scheduled to depart Malvern at 3:58 p.m. In fact, power problems were resulting in delays of up to 15 minutes on all of its Regional Rail lines throughout the day. Other areas of SEPTA service are affected as well, with Route 110 buses running on a detour due to a downed tree. Riders can check on the system's status or monitor SEPTA on Twitter. About 3,800 PECO customers in Philadelphia and the northern and western suburbs were still without out power at 6 p.m., down from about five times that many earlier Monday. Atlantic City Electric was reporting outages for more than 3,600 customers as of 6 p.m. There were two separate ground stops through the day at Philadelphia International Airport, but the latest was lifted around 5 p.m. The airport was warning that arrival flights were running an average of three hours later. It advised travelers to consult their airlines. The Philadelphia Office of Emergency Management recommended that homeowners secure all outdoor furniture and decorations. The ferocious winds ripped a chunk of mural off the facade of Hahnemann University Hospital in Center City Philadelphia. Monday night: Rain. Low around 37. Windy, with a northeast wind 24 to 29 mph decreasing to 17 to 22 mph after midnight. Winds could gust as high as 49 mph. Chance of precipitation is 100 percent. New precipitation amounts between a half and three quarters of an inch possible. Tuesday: A chance of rain, mainly before 4 p.m. Cloudy, with a high near 40. Northwest wind 16 to 18 mph, with gusts as high as 28 mph. Chance of precipitation is 50 percent. New precipitation amounts between a tenth and quarter of an inch possible. Tuesday night: Mostly cloudy, then gradually becoming mostly clear, with a low around 33. Northwest wind 13 to 17 mph. Wednesday: Sunny, with a high near 53. West wind 6 to 9 mph becoming southwest in the afternoon. Wednesday night: A chance of showers after midnight. Mostly cloudy, with a low around 41. South wind 5 to 8 mph. Chance of precipitation is 30 percent. New precipitation amounts of less than a tenth of an inch possible. Saturday night: Partly cloudy, with a low around 27. Sunday: Mostly sunny, with a high near 39.